There's a rebel within you. It's the part of you that already knows how to break free of fear and unhappiness. This rebel is the voice of your own awakened mind. It's your rebel buddha -- the sharp, clear intelligence that resists the status quo. It wakes you up from the sleepy acceptance of your day-to-day reality and shows you the power of your enlightened nature. It's the vibrant, insightful energy that compels you to seek the truth. Dzogchen Ponlop guides you through the inner revolution that comes from unleashing your rebel buddha. He explains how, by training your mind and understanding your true nature, you can free yourself from needless suffering. 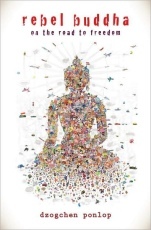 He presents a thorough introduction to the essence of the Buddha's teachings and argues that, if we are to bring these teachings fully into our personal experience, we must go beyond the cultural trappings of traditional Asian Buddhism. "We all want to find some meaningful truth about who we are," he says, "but we can only find it guided by our own wisdom -- by our own rebel buddha within."